Plant taxonomy classifies this dwarf catmint plant as Nepeta racemosa Little Titch (synonymous with Nepeta mussinii). Little Titch is the cultivar name. A common name used for this plant is "Persian catmint." Nepeta racemosa is an herbaceous perennial. The plant is also considered an herb, the genus having been used medicinally for centuries in a number of ways. For example, it has been used to treat coughs, congestion, and fevers; it has also been used as a sedative. Little Titch is a dwarf catmint plant, reaching a height of just 8 to 10 inches, with a width of about 15 inches. This clumping plant is a better choice for small garden spaces than is a bigger plant such as 6 Hills Giant catmint, which can be rather overwhelming. Little Titch produces a great many violet-lavender flowers, and it also bears fragrant leaves. Its foliage grows densely, and its growth rate is moderate. Indigenous to southwestern Asia, Nepeta racemosa can be grown in planting zones 4 to 8 in North America. Plant this ground cover in full sun to partial sun. Like most herbs, these dwarf catmint plants grow best in a well-drained soil because they do not like to have their roots sitting in water. Craving a well-drained soil, Little Titch catmint is a natural choice for rock gardens. Or use it as an edging plant or small flowering ground cover to define a border or pathway. When layering a flower bed, this dwarf catmint works well in the front row, as it will not obscure plants installed in back of it. Nepeta racemosa (mussinii) is a good butterfly plant and also attracts hummingbirds. But because of the smell of its leaves, it is a deer-resistant plant (deer pests tend to dislike plants with strong smells, such as most herbs). Nor is it counted among the plants that rabbits eat. Care begins in early spring, when, armed with a pair of scissors, you should go out and remove any dead vegetation left over from last year as part of your spring cleaning in the garden. Little Titch catmint can begin flowering at any time from early spring to late spring (depending on your weather, the region in which you live, and whether or not it is growing in a microclimate) and can continue to bloom right into fall with proper care. This perennial usually blooms well without a lot of work on your part, but it does not hurt to help it along a bit with deadheading. Since it bears so many flowers, however, it is easiest to bring out the scissors again and give it a haircut. Such a haircut in mid-summer will be succeeded by new blossoms later in the summer. This plant has moderate watering needs. To propagate it and/or to revitalize it, divide this perennial in spring every few years. This dwarf catmint plant makes for a well-behaved ground cover, effective at choking out weed plants in a small space if planted in a mass. But because it does not spread by multiplying, it is not the sort of ground cover that you would turn to for purposes of covering bare ground in a large, problematic area of the yard. Little Titch does not get out of hand like 6 Hills Giant, a much bigger type of Nepeta. Whereas 6 Hills Giant will overwhelm any perennials that you have growing next to it, Little Titch will mind its own business all summer. 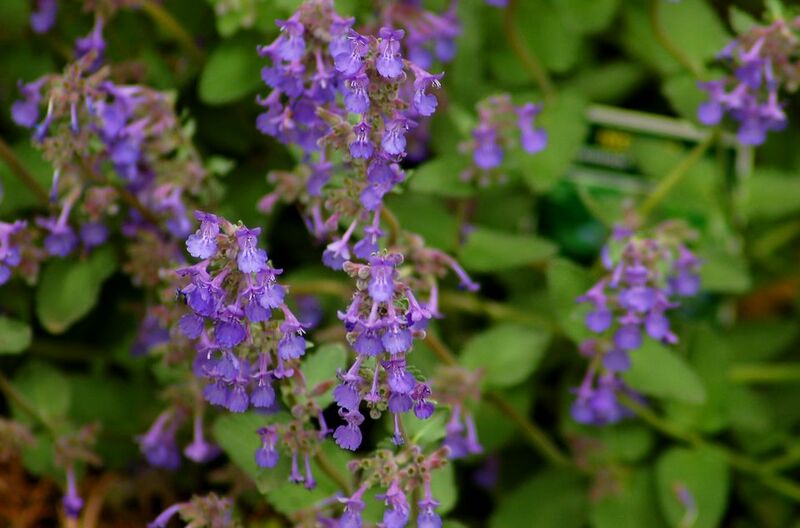 Nepeta racemosa) is a drought-tolerant ground cover, so it is useful for xeriscaping plans. This is a low-maintenance and long-blooming perennial, making it a great choice as a small filler plant if you are striving for continuous sequence of bloom in a planting bed. What famously drives cats wild is the catnip plant (Nepeta cataria). Other members of the genus, such as Nepeta racemosa (mussinii), may have an effect on certain cats, but, in general, North American gardeners grow "catmint" plants for aesthetic reasons and "catnip" plants for their cats' pleasure. While catnip is a type of catmint, you should avoid, for the sake of clarity, referring to other kinds catmint plants as "catnip."